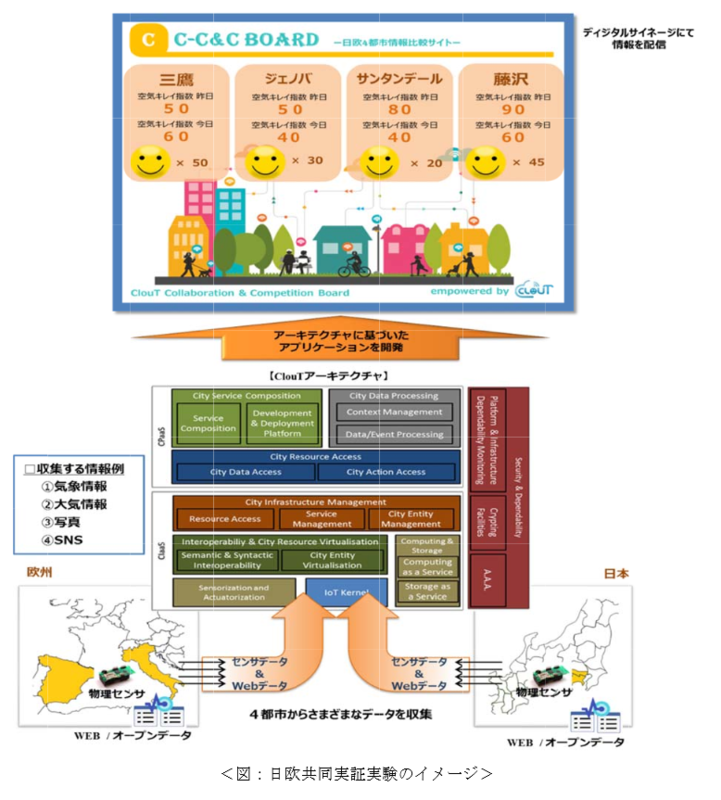 ClouT project has started its intercontinental field trial since mid-February 2016 in the 4 pilot cities simultaneously: Santander, Genova, Fujisawa and Mitaka cities are feeding the ClouT platform with their respective city data collected from various heterogeneous data sources such as sensors, web sites, legacy devices and citizens. As a result, the ClouT platform will provide smart city indicators for better citizens’ quality of life such as the number of smiling citizens happy to live in their city, current use of public transport facilities including bikes sharing services and levels of pollution (air, noise). Each city status is now displayed in real-time through both web and mobile dashboards, as well as in physical public spaces such as Fujisawa City Hall, Mitaka Industry Plaza (below) and Santander Tourism Office. Citizens are welcomed to participate to the friendly competition between the 4 pilot cities until end of March 2016! Coupons should be offered by local shops.